Recently my husband put time and effort into a task requested of him with an emphasis on the dire urgent need for his expertise. He was contacted and asked for help in creating a tshirt design that could meet a three-day-away print deadline for a non-profit. In the end, two weeks later, he was told that his work wasn't going to be used with a rather conflicting and yet evasively odd explanation. At the time he thought it was strange that the circumstances surrounding the solicited, dire need had all of a sudden changed to a completely different situation and he surmised then that he was on the receiving end some sort of shakedown. I mean, for the original desperate need for his urgent (had to be at the printers in three days to get shirts on time) free design work to turn into (two weeks later) "nevermind!! HA HA! My bad! Didn't I tell you it was a design contest all along and yours just wasn't chosen as the winner" just doesn't add up, does it? He went back and read the original emails asking for his help and he was definitely either straight up lied to/tricked into entering a contest on the basis that they needed his help as a volunteer designer from the beginning OR someone (after the fact) pulled a dirty stunt on him and threw a a little hissy fit that he couldn't be the designer of the t-shirt for the Express Yourself Art Conference. At the time, we shrugged our shoulders and wondered who botched that professional, pro-bono art design job up. I did know the people originally involved well enough to know that they were not liars and that they were surely trying to cover up some odd internal blunder regarding his design. Now we know, and the only thing I feel is moronic for not putting two and two together before I had to be informed. I am currently appalled that I have recently become privy to the knowledge that he was right. The circumstances didn't add up...and someone who has entirely too much crazy going on inside their noggin intentionally put the kibosh on his design being used. Once again, some things never cease to amaze me, though by now I should be used to it. So now, to whom it may concern: GROW UP!!! You will eventually run out of people or situations to manipulate. 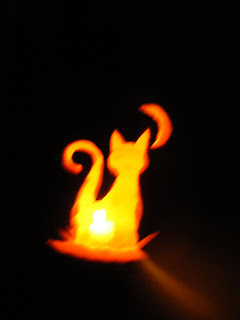 We carved a pumpkin tonight! Miles chose a kitty kat design...and then had to add some glitter. 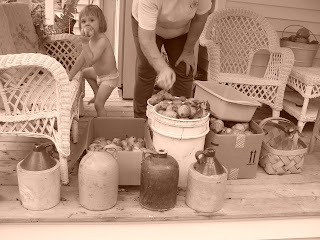 Lola and Miles helped Mawmaw and PopPop pick pears last week. Did I mention that they also helped them eat the pears?? 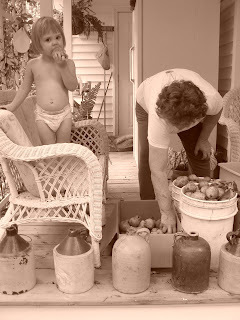 Notice how well the antique jugs that have been around the house for my entire life now adorn the farmhouse porch! It looks amazing. My parents have such a sense for artisticly displaying their collections. Never would I have dreamed that they would put these outside! They are all very old! I can remember them sitting on the hearth or around the den when I was just knee high. I think they mostly came from an auction house in Louisiana in the 60's or 70's. These are the same jugs that my parents have reminded me at least 120 times to have appraised before "getting rid of them" after their demise. They don't trust me. Or my siblings. Everything in the house has been ordered to undergo appraisal before we "get rid of it". I don't quite think they realize that we probably won't "get rid of" much, since most of their stuff is awesome. P.S.S. Yes, that is an extra fridge on the back porch. It houses Cokes. Seriously. With four kids, their four spouses and nine grandkids, I guess it makes sense. 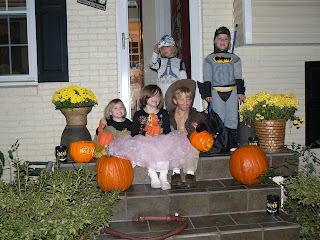 Tonight we had a little Halloween party at Shea's! It was fun! At one point, Coen referred to Lola as "Miles' baby" and we had a big laugh! The Preds scored 5 goals! We got Frosty's! 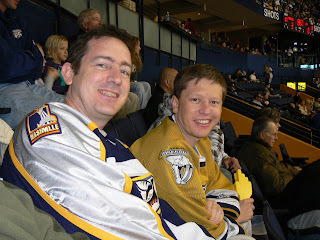 On Saturday night, we went to the Preds game with Casey and Hal. Fun was had by all. We went to Satco before the game, which I absolutely love, so that was awesome, too! So next Saturday, Phil and I go to a Murder Mystery party and Leigh Ann and Tim's house. It is a costume party and I am not sure what I'll be yet. I am taking suggestions but have a few rules! LOL! I've had two babies via c-section and my eating habits haven't been that great this year. It can't be anything that will be tight in the middle or bare midriff. It had to be somewhat comfortable...not some big contraption that I can't sit down in or can't quit running into people in. it can't be ridiculously expensive. Sign up online for Pizza Hut to email you deals or coupons. They will email you 20% online orders sometimes. Order Three Pizza Mia, one topping medium pizzas with 20% off. That will make them only $4 each!! Your order will be $12 plus tax if you pick it up. Even if you don't live in a delivery zone, you can still order online. Tonight we treated the girlies to a pizza and movie night! They chose to rent a Scooby Doo dvd of old episodes and Aristacats. I picked up Friday the 13th I and II for Phil and me, as well as The Wedding Singer. I made a pallet on the floor for them and they enjoyed themselves immensely! Then they started whining about going to bed after all of the spoiling/attention! AHHHHHH! The double edged sword of parenthood! I swear! You do something nice and they behave worse than normal. I just told my neighbor this week how I'd bought them toys at Walmart that day and then they promptly stopped listening to me! UGH! Then again, who am I kidding? OH, how I love those booboos! Thursday night we went to see Ben Troxler's new East Nashville home! It was so neat and we had a fun time. I love the back-splash in his kitchen, which is made up of many tiny 1" or so tiles in a great mix of earth tone colors, from sage to taupe to brown. Sweet! I also can't forget to mention how much I fell in love with the antique table that he bought for his kitchen. It was fabulous! Beyond words! Very long, probably 10', with dark stained legs and a lighter stained top made of loooooonnnnnngggg planks of wood on top. Gorgeous! Then again, what DID I expect?? It's Troxler! For his little open house, shindig, I gave him a JLM cookbook and Mandy gave him a gift card...and a little black boy cherub praying statue and a Jesus night light. He loved it all, I am sure, since he's so gracious. We came real close to heading to Lipstick after the party split up but then we decided just to head back to the 'boro. PS Isn't he freakin' adorably hot???? Even in tough economic times like these, we can find things to be thankful for if we try. i am thankful for my parents, who often offer unexpectedly to let my children come out to spend the night at their home. Yesterday afternoon, they took Miles and Lola to meet a three week old baby calf at Mr. Harold's house. Lola wouldn't touch it, though just the day before she begged to pet "the cows" at his house. Miles, though, did pet the soft baby calf and even fed him his bottle of fresh milk! How sweet? I am also thankful for my husband's parents, who spoil Miles and Lola with undivided attention and special, unexpected treats like McDonald's and the playground. Memaw Joan lets them get away with murder and eat like they're on an all inclusive cruise, but that's what Memaw's are for, right? Papaw, according to Miles, saves all his money (i.e. his change) and gives it to them for their piggy banks. Tonight they got to Memaw and Papaw's in Franklin so that Phil and I can got to the Pred's game with Casey and Hal! They can't wait! They've been counting down the time until they arrive in Franklin. In fact, I must have been asked 12 times Friday if it was time to go to Memaw's yet!! PS I am secretly hoping to convince the boys to go to SATCO! LOL! One of the things that I've been working on lately is a new type of pendant. These pendants are more kitschy than my normal jewelry line. They are made of a wooden circle or rectangle with an image on one side. I make them myself. They are sold on a beaded necklace for the price of the necklace plus $5 or on satin cording for $6. People really seem to like them. I make all types but my favorites are the ones with vintage images on them. Some have print designs instead of a specific image. I'll have plenty to see at the Holly Day Market at Embassy Suites on November 15th. You can also purchase a metal necklace to hang the pendant from at Mesh for $3. That's secretary Miles, to you, thanks! Today, I called my parents' house. Miles answered. Miles: Is that you, Momma?!?! Me: Yes! It is! Are you having fun, baby? Miles: I'm having a greeeeaaaat time!! Me: Oh, good. Well I love you! Miles: I love you, too, Momma! Me: Can I talk to Mawmaw? Me: Oh. Well, okay. Where is she? Me: Oh, okay. Well can you for me a really big favor? Me: Can you ask Mawmaw to call me when she comes inside? Miles: Mawmaw, I have really great news!! Mawmaw: What is it, baby? Miles: My mommy called and she wants you to call her back. Woot woot! 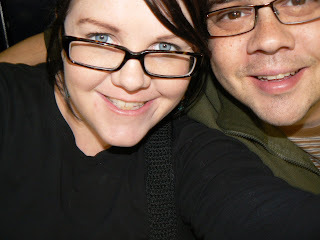 I had totally forgotten that my husband and I are going on a date Saturday night to the hockey game. Hopefully, Casey and Hal will be there, too! Tonight for dinner I had a Frito Bandito. You know, chili poured right into the bag of Fritos with shredded cheese sprinkled on top???? YUMMY! Totally reminds me of childhood. I didn't think I would like it very much, but let me just say that it was awesome. I don't recall calling this concoction a Frito bandito, but Phillip says that's the "official" name. LOL! I am excited that tomorrow night is my official installation as a full fledged member of JLM. Friday, Monday and Tuesday are days that Phil took off work. YAY! He gets a lot more vacation time than many...but he's not so good about using it. Let's just say he often complains that being out of the office just creates a heavier work load for when he returns...which is no fun for him. I have to stay on him hard just to get him to take all of his days. Needless to say, we spent Friday being mostly lazy since I have such a bad cold. Saturday was Milesy's birthday and her party, as well. The party went wonderfully. Here she is at age two and a half, cheesing for the camera in Aunt Dink-Dink's condo before we heading to the outlet mall in Destin. It is so hard to believe my baby is now five!! The party had a Little Einsteins theme with awesome pizza, little baggies of chips and beautiful, delicious cupcakes! We also had ice cream...but I forgot it at home. We, I didn't exactly forget the ice cream cups. I intentionally left them in the freezer since we live about 60 seconds from Barfied Park...but then I forgot to send someone to the house to get them until it was too late! We had plenty of little friends in attendance, which means we had their parents for us to visit with. It was great to see Mrs. Thang, herself, Sarah Scott! Thomas is growing like a weed. Mrs. Sarah and Thomas brought Miles a new art easel, which is fabulous considering that the one she got for Christmas ending up getting knocked over, thus it lost a leg. The generosity of people is a welcome reminder that people care about your children, not that I am saying they have to show it through gifts. I am just pointing out that every child brought something just perfectly picked for Miles, which is nice, b/c their parents could have grabbed some random toy and wrapped it up. Instead, everyone seemed to spend time picking out a special present. Miles was so overwhelmed by her friends. She seemed to include everyone in the fun, which was wonderful, as well. Seeing all of the other parents was great, too, but I do get more of an opportunity to see some of them regularly than Sarah. I was also excited to hear that Sarah and her hubby have decided not to build a new house in north Murfreesboro, b/c they are much closer to us if they stay right where they are. I am also glad that I only ordered 8 pizzas from Pizza Hut, because we still had an entire pizza left over. Mrs. Mandy Candy Kelly, aka Mrs. Mandy, bought Miles a pinata, brought it over one afternoon this week and filled it with a ridiculous amount of candy. 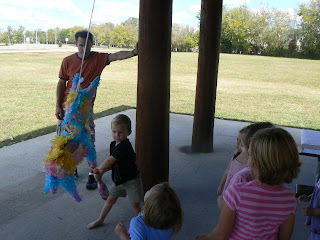 We normally have a pinata, but it was so special that Mrs. Mandy picked one up not realizing that little fact. It was a donkey, but Miles really thought it was a unicorn. Today (Sunday) was extremely lazy for me as I was the sickest I've been this week with my cold. Tomorrow, Phillip is taking my car in b/c the air has mysteriously stopped blowing. Tuesday, Phil and I plan to have lunch at Puleo's while my parents watch the girls. I love Puleo's, so I am happy about our little lunch date. Then it will be back to work for him on Wednesday...the beginning of a busy season for him at work. DRATS, I'll miss him! Just a quick reminder...Nov 15th is the Junior League's Holly Day Market at Embassy Suites. There is a small ticket cost ($5 I think) but that goes to charity and the day is usually fun! Forgot to mention, I'm sick again, so please pray for me! I don't know why but my allergies have been in full force again this year for the first year in a long time. This year has been trying for me, health wise. I have fought the stomach bug at least four times in the spring, I had Bells Palsy this summer, I had a righteous cold the week of Labor Day and now this round of a cold. UGH! Calgon, take me away! Which reminds me, I have had three baths today due to this coughing funk so I better smell fabulous! So I've been thinking lately about things I might want for Christmas. I know, it may seem premature...until you realize that the last few years, compiling a list has been very troublesome for me. A skinny scarf made of fabric that isn't necessarily cold-weather fabric. Two tickets for Mandy and me to see NKOTB.